My mailman rarely talks to me, but he made sure to tell me that this soup smelled great when I was cooking it. So, there you go, endorsed by the US Postal Service. The thing about this soup, is that it’s almost the only time in the world where I don’t rinse the canned beans. The whole shebang is poured right in, creating a flavorful full-bodied broth that is so monumentally satisfying with the chewy quinoa. Of course, we have our usual black bean soup suspects — cumin, oregano, bay, cilantro — and all that flavor just gets sealed into the delicious broth. It’s familiar but definitely not ordinary. You can certainly customize to your desires; add some kale at the end, maybe even potatoes with the carrots, or corn. I would have used jalapenos if I had some on hand, too. But the red pepper flakes provide a nice heat and this soup hits the spot if you’re craving something spicy and filling, that you can throw avocado on. ~If you’re wondering why I add only half of the broth at first, it’s so that it boils faster, thus cooking the quinoa faster. It’s just something I do. ~If you’re wondering why I don’t add the beans with the broth at first, it’s because when soup is thick, it takes longer to cook the quinoa. So I let it cook most of the way, then toss in the remaining liquids. ~Black beans tend to be salty, so I’m not adding a specific quantity of salt here. Definitely salt to taste! Preheat a 4 quart pot over medium heat. Saute onion in olive oil with a pinch of salt for about 5 minutes, until translucent. Add garlic and saute with the onions for a few seconds. Then add tomato, cumin, oregano and red pepper flakes and cook for a minute or so, just to break down the tomatoes a bit. Add the remainder of the broth, the black beans with their cooking liquid, and the cilantro. Cover and bring to a boil, then remove the lid, lower heat to a simmer and cook for 10 more minutes or so, to cook the quinoa the rest of the way. Taste for salt and seasonings and let sit for 10 minutes or so to allow the flavors to marry. Remove bay leaves and serve topped with crushed tortillas, avocado and cilantro. Dammit, Isa! Cut it out with all the yummy recipes! ha ha! I’m hoping to make this soon. I’m interested to see how it is without rinsing the black beans. Thanks! Can’t wait to try this! Looks and sounds delicious! How did you know that I was craving black bean soup??? I made this tonight for dinner and it was really, really good! I didn’t have fresh cilantro on hand, but I have a commercial frozen cilantro that comes in 1/2 tsp. portions and used three of them in the soup and it was perfect! Thanks for all the great recipes and ideas! Well, I have NEVER heard of commercial frozen cilantro, so that’s a revelation! Glad you liked it. My girlfriend asked me to pick up avocados today, and I immediately knew what she was making. She’s a PPK addict, and has almost converted me to a vegetarian, thanks in no small part to Isa’s recipes. Btw, try adding sweet potatoes, it was delicious! Made this for dinner tonight and it was absolutely lovely. 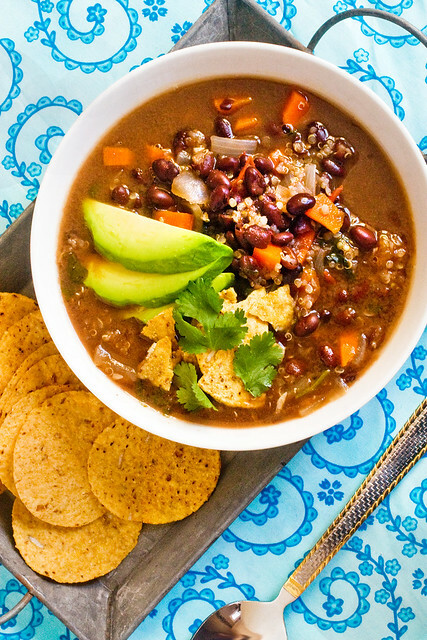 I’ve had black bean soups before but there was something special about this one. Followed the recipe exactly, but will definitely be experimenting next time. Thanks! Made this for dinner tonight. It was delicious! My meat eating husband devoured his bowl!! No, you’re supposed to eat the SOUP, not the BOWL. Bahahahahahaahahahahhaahahaha. I know this response is old but I’m over here chuckling. Had to comment. Going to pick up the ingredients I’m missing tomorrow so I can whip this up! Made this tonight. It was so so so amazing. I completely forgot to add the carrot :/ but it turned out wonderful anyway! Yum, this looks great! I was just thinking how nice black bean soup would be. I’ll definitely be making this once I get a chance to pick up some groceries. Oh, forgot to add this in my last comment: Is 24 oz of black beans ~3 cups? I only have 15 oz cans. Something like that. 2 cans will be fine! OMG This is going to be dinner tonight at my house. Will canned whole tomatoes also work? I have everything else, and I usually put off recipes with tomatoes until later in the season. Simmering on the stove now! It smells delicious and look how short that ingredient list is! Perfect for a weeknight. Cooking this now. Made 1/2 the potions since I’m cooking for one. Smells amazing. This was dinner tonight, another Isa HOME-RUN!!! Whenever I am in a cooking slump I can always rely on you to pull me up out of it!! Put all this in the crockpot and can’t wait to come back to it for dinner. Thank you!!! Awesome! Just finished making it for dinner. Home run with vegan teenager and carnivore hubby. A huge hit with me, the cook….super easy. Delicious, healthy and satisfying. Thank you!!! WOAH! Welcome to SALT TOWN! I added a couple of extra cups of water at the end to save the soup because it was just TOO SALTY – maybe my bean liquid is saltier than the brand everyone else used… or maybe less is more if you make this with stock cubes. I ALWAYS use cubes, and never prepared stock, because I’m lazy/poor. Otherwise, this was a really nice recipe! Love that it came together so quick and cost next to nothing per serving. Thanks, Isa! Brilliant. Am eating it as I type (and as the chocolate bundt cake cooks in the oven). Amazing flavors (at mercy of my pantry so used one can cannellini beans, one can black beans). The quinoa gives it a deep, chewy yum. Topped with some tofu whirred in the blender with lemon. Isa, you are the BEST. Thanks for your constant generosity in sharing your flavors with us!!! Subbed a 15 oz can of fire roasted tomatoes for the fresh and chunks of sweet potato for the carrot. Delicious! This was super good and so easy! I subbed ground New Mexico Chiles for the red pepper flakes and it was great. Looking forward to trying it as written and also playing around with other vegetables. Omni boyfriend also loved it! I made this last night and it was amazing! Even the kids gobbled it up! I should like to submit the following evidence. Your Honor, it concerns an official agency of the United States Government. The Post Office…. If the post office recognizes it, it must be true. Trying it out tonight along with the tip to add only half of the broth at first. 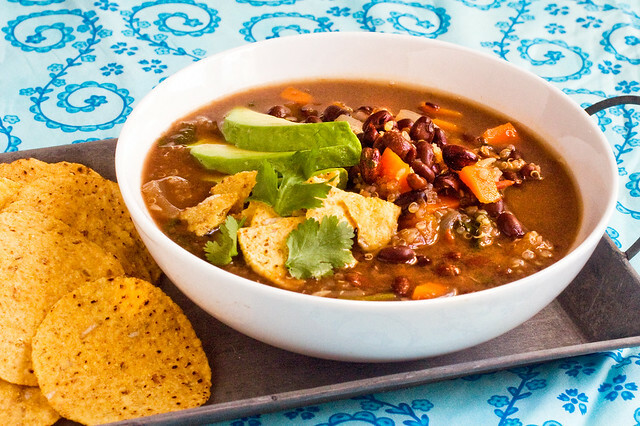 I am a black bean soup snob, and this recipe was amazing!! It could be my favorite black bean recipe! In my earlier comment, I was just PLANNING to make this. When I actually DID make it, it exceeded expectations! I added chopped kale and topped it with avocado slices, as it appears in your photo. I even stole your tortilla chips on the side idea. It was awesome. Definitely a keeper. I made this last night. I am making it again tonight. I have never done that before. Yum! This soup tasted good. I used chopped parsley instead of the cilantro and it turned out great. My avocados weren’t ripe but we didn’t miss them. Yep. This was dee-lish! I love not having to rinse the beans. (Cuz I’m so lazy!) This was an excellent way to use up some of the five containers of veg. stock in my freezer. I added a whole bunch of sweet potato as well, and a lot of kale too. Thank you, Isa for the sunday night soup inspiration! Hello there | Survival is an art form. This would be great with some limes! I’m making this for the second time right now. I put in jalepenos and it’s deeelicious. Thank you for the recipe! This was sooooo good! Instead of using oil. I just used vegetable broth to cook my onions. I am trying to stay away from oils and it was so good, especially w/ avocados. I’ve eaten this everyday this week for lunch. So delicious! It tastes awesome with slices of avocado (w/ salt and lime juice squeezed on) used to scoop up the soup. Thank you!! So now I am soaking my black beans tonight, this looks perfect for tomorrow. I made this the other night and it was amazing. So good I’ll probably be making it again in the next day or two. Really great recipe. Damn, my black beans were salty as hell. And like a fool I didn’t do a taste test and added another bouillon cube (because I only used 1/2 of one, which according to the package is equivalent to 1 cup of chicken broth, I subbed water for the rest). So now I have a soup salty enough to curl the hair on the saltiest of sea dogs. Still edible, just needs a lot of avocados on top (I also threw in some kale). Next time I’m gonna monitor the saltiness for sure. Thanks Isa! Made this last night – SO good. And even better today! I used low-sodium broth so the overall salt ratio was fine. I also used canned diced tomatoes cuz it’s a little early for fresh (and I live in Chicago where it’s apparently never, ever, ever going to be warm again, so I may never use fresh), and they were great. I’ll try butternut squash in there next time! Thanks as always, Isa! Made this for the first time tonight. It was my first black bean soup, and will most certainly be made again in this house. Delicious! Thank you. I’m out of quinoa at the moment, but I do have green lentils and brown rice. Could I use either as a sub? If I use the lentils, maybe would I cook them ahead of time and put them in then? Thank you! I have made this twice now super yummy!! Thank you for sharing. Made it for our staff, 13 people total. It was a hit and folks were asking for the recipe. I used dried beans which I soaked and cooked, and canned diced tomatoes instead of fresh, to adapt this for a large group. Thank you, Isa, for another great recipe. Super easy to make and full of great flavor! This looks fantastic! Do you think I could use farro with the same results? Farro takes so long to cook, I’d soak it in warm water overnight before adding it. I am making this tonight. So excited! Also, I just realized that I own the Appetite for Reduction book on Kindle, just never knew there was a blog too :/ hooray! I made this tonight for dinner. Incredible! And so simple too. Thank you for the great idea. My husband says thank you also ha ha. My fiance and I made this the other night and it came out super delicious! Thank you!! Simple to cook, inexpensive ingredients, takes just half an hour to prepare…top! This was fantastic. Very quick and easy. Phenomenal! Thank you. I couldn’t handle keeping the bean liquid, but I did stick my hand blender in the pot a few minutes before it was done to puree some of it. Just made this, and it is FABULOUS, even though I forgot the bay leaves. I’m new to the vegan world, so I was totally shocked at how great this is. AND, so easy to put together! And, cheap! Whoohoo! I made this soup for lunch today and my non-vegan husband says “Wow. This is easily the best soup you’ve ever made!” HAHA! Easy and tasty recipe. Thanks!! I just made it! It is SO GOOD! thank you! I added okra because I had to use mine, I also added sriracha instead of the red pepper flakes, and I upped the water since I did not have any canned beans and added okra. YUM! Isa, you have the baddest collection of recipes anywhere! Thanks for sharing. How could I have not commented on this recipe? This has become my go-to soup when I don’t know what to make for dinner. In fact, I make sure I always have these ingredients (or substitutions) ready to go so I can make this soup at a moment’s notice. It’s more than the sum of its parts — hearty, delicious and so easy to make. It was really great. I added fresh lime, corn and put the avacado in then blended half. It was so great and healthy. Thanks again! I’ve made this before and it’s delicious. It’s really great garnished with some sour cream or plain yogurt, tortilla chips, chopped cilantro, avocado and lime – yum! Making it right now! I just made this tonight for dinner. It was awesome!! Also, I know it’s supposed to be a vegan recipe, but I made it not vegan… Instead of vegetable broth, I used chicken broth, and threw in some small chicken pieces. It was really delicious! My boyfriend and I both loved it, and were full after one bowl! Thanks for the great recipe! Wow, is this great! Easy, simple, and delicious! um yeah… i just ate 3 servings. mmm. maybe 4. Excellent. It’s now on the lunch roster. Just made this. It was awesome! I think I went a bit heavy on the cilantro (what measurement cups? ), but otherwise it was perfect, and easy to make. I know, I have to get that fixed! I thought you needed to rinse quinoa. This is a great, easy recipe! I used an organic version of something like Rotel, instead of tomato, skipped the bay leaf, used a 15 oz can of black beans, added 1/2 can of re-fried beans (stir in before adding the black beans and second amount of vegetable broth), and added an extra cup of vegetable broth. It was really great! I love adding the tomato/chili mixture and re-fried beans to every soup and/or chili. PS. There have been a lot of comments about this recipe being too salty. The recipe doesn’t call for any set amount of salt. If you’re using black beans and broth that are salted , perhaps you should omit any additional salt (just put it on your table as an option). Otherwise, get unsalted black beans and/or low sodium vegetable broth. I have a history of botching dinners I make for myself and my boyfriend. A long, sad history. But Isa to the rescue! I made this soup last night, it was totally doable, and it came out just beautifully. He LOVED it, I was proud that I made something so tasty. A big success! We ate it again for lunch today. Thank you, Isa! This soup is so delicious and flavorful. I’ve already made it three times and plan on making it again this week. It’s just…mmmmmm. Sometimes I get tired of leftovers, but not this. I could eat the whole pot in one sitting if I’m not careful. Recipe is simmering now. Made a few changes due to brain fart at the store, Tomatillo’s instead of tomatoes, added leeks and potato’s to thicken it up a bit.. smells AWESOME, can’t wait to dig in. Keep up your awesomeness Isa! Tried it, nailed it, will make it again. I used a bit more, tomatoes, quinoa and black beans but it was no problem at all. I just added more seasoning to compensate. Garnished with tortilla chips and avocado. This is my standby soup! Always delish and so easy to make! Keep the amazing recipes coming! Cooking now – adding some sweet potatoes to the bottom of my bowl 🙂 The initial taste test was great! Thanks! Had to make a few modification or allergies and this still came out fantastic! I omitted the tomato, quinoa, and garlic then halved the broth and spices and pureed, This one is going int he book for sure. This was SO GOOD! I added a jalepeno and it is nice and hot! Perfect soup to help warm up in the chilly season. Thank you for sharing! This soup is transcendent! i want to make it once a week now! healthy, easy and DELICIOUS- the holy grail of recipes! Why oh why can’t I reach through this screen and grab a bowl of this yummy stuff! I’m so sure 5 min. from now with tech. being where it’s going…well ya know? I was looking for a recipe to make for a friend who’s laid up with a broken ankle. He’s diabetic, so as I was doing some research I learned that quinoa is a good option for diabetics. I came across this recipe and deemed it perfect for him as he likes southwest flavors. I just made a big pot and will be putting it in single serving containers for him. Great delicious flavorful soup! Good for a cold winter night yumm! Just had this for dinner. The whole family loved it… little kiddos included! Couple notes for anyone who cares – I added some extra broth, with organic frozen chopped kale and a sprinkle of chili powder during the last step. Also used salsa instead of fresh tomatoes which I think added some nice flavors. Unfortunately, I didn’t have avocado, but we really love to add Greek yogurt on top of chili (instead of sour cream) so we all did that. l’m definitely adding this into regular rotation! With the polar vortex threatening to descend with more snow and chaos, I was looking for something warm yet meat-free and wheat-free. This won huge props from the whole family. It took everything I had not to rinse the beans and use the liquid, but I trusted you, and am glad I did. Thanks! Wow! I just made this soup and it is wonderful! I already had all of the ingredients except the cilantro. And I added some barley just because I like it in my soups. I keep making this – it’s ridiculously good! Yum. I accidentally added too much cumin and chili pepper. Since I had two 15 oz. cans of beans and extra broth already made I decided to make up for it by adding extra everything except seasonings. Though honestly, in the end, I probably didn’t need to add the extra quinoa and probably could have handled the zing. Now it’s a bit more stewy than soupy but still yum. Had it for breakfast this morning! Wow, this is great tasting and easy to put together! I really like the combination of simple ingredients. Thanks for the recipe! It will definitely go into my favorites. Made this a few nights ago and it was AMAZING! So sad I gave all the leftovers to my in-laws. Would I be able to use different beans i.e. white/pinto/lentils or would the flavor not be the same? Thanks! Isa, my 25 year old daughter repeatedly insisted that I make this. I trust her completely and doubled the recipe. It is just as terrific as she promised. I dumped in corn and some tiny yellow, buttery potatoes and topped everything off, as you suggested with tortilla chips, cilantro and diced avocado. This is fantastic. Soooo glad we have leftovers. You rock! Do you think I could make this in a slow cooker? Would I need to modify anything? (sorry, I’m a bit new to the whole cooking thing. Trying to be healthier, now that I’ve graduated college). Thanks! I just made this and it was really yummy! I didn’t have cilantro but made it anyway. It is good and I can’t wait to try it again with the cilantro. Thank you. I just tried this today, it was absolutely fabulous, easy and quick to make. Thank you! soupe haricots noirs et quinoa | Gourmande, mais pas trop! So delicious!! We added chicken and chicken broth and it was beyond wonderful! Thanks for the great recipe. My mother in law made this and it’s wonderful! I’m goin to have to try to make it myself. This was excellent. I changed some of the ingredients only because I didn’t have them all but it was really, really great. Hubby had 2 bowls and that is the true test. Thank you. My co-worker and friend shared this recipe. I made it with my sons help this week-end and it is just awesome!! I tried this soup about two weeks ago, and my family loved it! Going to make it again tonight! Thank you! Great recipe! I love it! It´s the best in the cold autumn in Berlin! Made it just now. Delicious! After reading the ingredients, I thought it’d be too southwestern for my taste tonight, but the herbs/spice is not too strong at all, just right! Nutritious and delicious. My husband tasted it from the pot and demanded a bowl! 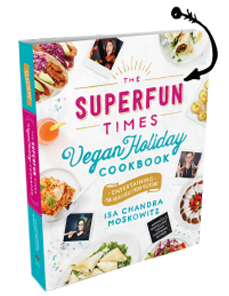 FOR A NEW VEGITARIAN THIS IS SO AWESOME! I AM LEARNING AND MY FAMILY IS ADAPTING BUT WE WILL NEVER GO BACK! YOU ARE NOW ON MY FAVORITES! Just made it. Kids love it! Thanks!! This recipe is a keeper! Wow it’s good. This soup is so delicious I am making a double batch for the freezer. Makes a great lunch for work. Huh. I’ve been adding corn to the soup for the two years I’ve been making it, and now that it’s soup season again, I googled the recipe and realized that it never contained it. Crazy! Amazing with corn and extra cilantro. Great picture, but I hate the taste if canned anything– especially beans. It’s worth the time it takes to cook your own. Made this soup last night for lunch today and ended up enjoying a steaming bowl without the added toppings. Picked up the toppings and am enjoying this for lunch. WOW! I thought no soup could be better than the potato fennel. Neck and neck favs. SOOOOO good! Made this tonight and both my son and I loved it. I found no salt added black beans to reduce the sodium to a very low level (only 10 mg sodium per serving instead of 220 mg or 400+ mg). Still salty enough with the tortilla chips. I topped it with a scant tablespoon of vegan sour cream and a sprinkling of taco sauce. This soup is delicious! Love it! You create great recipes! OMG….the best, best soup ever. I made this using one can of black beans (didn’t have more) and 2 Tablespoons fresh cilantro and a pinch of red pepper. Didn’t have avocado or chips. Not a problem, pita bread is a great substitute. Thank you for this terrific soup. So easy and quick to pull together. Can’t wait to try other recipes. The flavor of this soup is awesome! We don’t have cilantro, avocado, or bay leaves on hand, but I added in a 1/2 cup of frozen corn with the black beans and it turned out delicious and robust! We use better than bouillon’s vegetable base and a can of crushed fired roasted tomatoes in place of the fresh. Super tasty and easy to prepare. This soup is amazing! Keep sharing these recipes please! I made this tonight and though I had to make some substitutions (sage for bay leaves) it was tasty and satisfying and the perfect thing for a brisk fall day. I sprinkled a little nooch on top because I put that @!#%%&! on everything! Dang, this was tasty! I’m making it again. So I shouldn’t drain the canned beans? Great recipes. The only difference is that I use only fresh beans soaked from the night b4. Never canned food.